Answering the request for constructing low and zero energy housing and passive house design RASTRA has created a panel which offers extreme insulation and maintaining all the other advantages of the well proven RASTRA element. 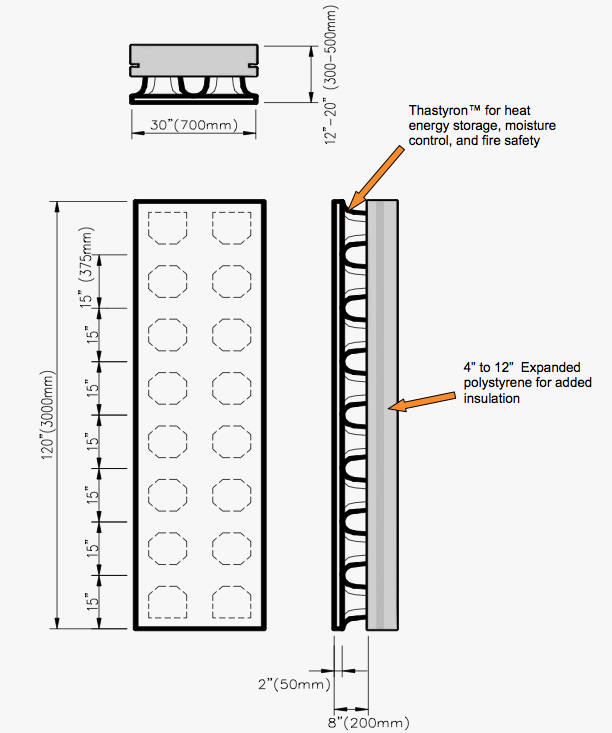 The RASTRA-Therm™ panel meets and exceeds thermal AND physical performance required by any code for extreme climate. 40 years ago RASTRA engineers created the first Compound ICF by combining expanded polystyrene (EPS) beads with a cement based mix as a stay in place form with an engineered system of concrete skeleton inside. 10 years later RASTRA explored the use of recycled EPS in its product. Now, as demand for even higher insulation is rising, RASTRA engineers again offer the ultimate solution by combining Thastyron™, the material RASTRA is made of with an additional insulator. Thus keeping the advantages of a micro-porous, higher density material at the inside of the building and the extreme insulation, a panel of higher density EPS at the outside. Easy electrical and plumbing and solid substrate for finishing. Outer barrier against water penetration. Inside the RASTRA-Therm™ panel you find the same system of cavities as in a RASTRA panel, designed to take high loads using a minimum amount of concrete and steel. RASTRA-Therm panels are easy to work with and can be cut to any dimension on site or delivered as preassembled wall segments as regular RASTRA walls. Of course, both systems can be combined. (produced on special order in Europe).